Smoked venison sounds like it should be awful — if you’re used to smoking pork. Smoked, pulled pork, gently cooked for many hours until it falls apart is one of the great things about being alive. But you can’t do that with venison, alas. Pork is, well, fatty. Porky, with lots of little packets of fat in between the muscle fibers that means a slow-smoked pork shoulder will baste itself. Deer are lean, especially when you get to the interior of a cut. And fat, as you may know, is insulation — and insurance policy against cooking too long — so the fact that a venison ham has none means it can go from sublime to dog food in a matter of minutes. So is there no way to properly smoke venison? There is indeed, but you have to shift your barbecue compass to the West, to Central California, to be specific. The only contribution California makes to the barbecue universe is called Santa Maria Barbecue, normally done with beef tri-tip, a cut from the lower part of the cow’s hind leg. It is wonderful stuff, smoky with a lovely spice rub. But here’s the thing: Santa Maria BBQ, or what we here in Cali just call “tri-tip,” is never cooked past medium. To do so is a sin. Venison roasts, typically single-muscle roasts or those with just a few muscles — from the hind leg — are what you want when you make smoked venison. You can do this with a big section of backstrap, too.
. That consists of tossing a hunk of meat into a hot smoker and cooking it until the meat hits the proper internal temperature. To really smoke venison you will want to salt it first. Not a full-on cure, but a nice salting.
. Yes, you must measure things for this recipe. You measure your hunk of venison. Do this in grams. Then you measure out 1 percent of that weight in regular kosher salt, and add an equal amount of sugar. If you feel like using a curing salt — I don’t — add no more than 0.2 percent of the venison’s weight. You’ll want a cure marked No. 1 here, not No. 2. Again, I don’t use curing salts, but you can. Mix your salt and sugar together and get yourself a big tub or somesuch so you don’t lose any of it. Now you massage the salt/sugar into the venison, taking care to get it around the femur if you’re doing a whole leg, which is a cool thing to do if you have a teeny deer; the one in the pictures is an Arizona Coues deer buck. Now put your venison and any remaining cure into a big bag and set it in the fridge. How long? Two days per pound of venison. Then rinse the meat off, pat it dry and, if you want, let it sit uncovered in the fridge an extra day. You can skip this if you want, but it helps make the meat smokier.
. I happen to have one that comes with the Traeger I use. That’s it. 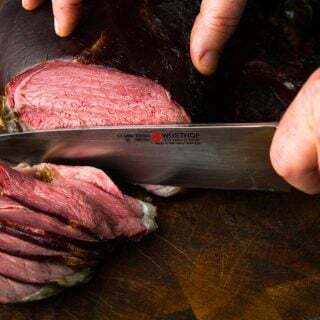 Measure your venison, lightly cure it in the fridge a couple days, smoke it slow and low until it hits the right temperature, let it rest 10 minutes on the cutting board. Slice and eat. 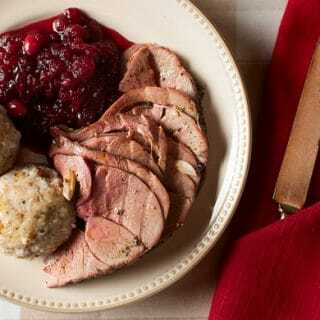 This smoked venison is basically the best “roast beef” you’ve ever eaten. Don’t believe me? Try it. I do this with cuts of the deer or moose, elk, etc, that you want to eat medium-rare, so the hind leg whole or in big roasts, or a section of backstrap. Any sort of red-meat animal will work here, so if you have lamb, goat or mutton it'll work fine. Mix the salt and sugar together and massage the mixture into every part of the venison. Do this over some sort of tub or container - a baking sheet works well - so you don't lose any. Put everything, including any stray cure mixture, into a large plastic bag or container that will just about hold the venison. Let this sit in the fridge anywhere from a week to 10 days. Turn the meat over once a day. Rinse off the meat and pat it dry. If you want, you can set the venison on a rack uncovered in the fridge for a day before smoking. Smoke the meat slow and low - I prefer somewhere between 175F and 200F - with an internal probe thermometer stuck in the thickest part of the venison. Do not let the probe hit bone. Smoke for between 2 and 5 hours, or until it hits an internal temperature of no lower than 120F and no higher than 140F. I prefer about 130F. 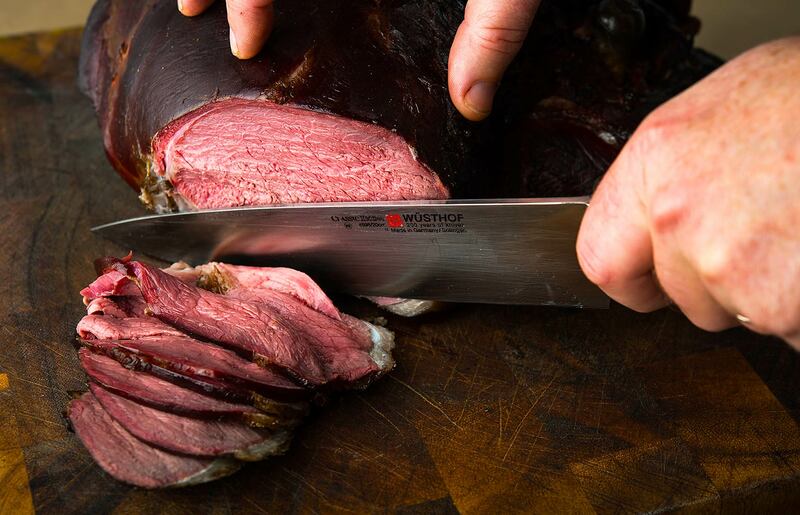 Let the smoked venison sit on the cutting board 10 minutes before slicing and serving. It will keep a week in the fridge and freezes well. NOTE: I use a 5-pound venison roast just for illustrative purposes. You can do this with anything from a pound roast to a giant leg; it'll just require different amounts of cure and smoke time. 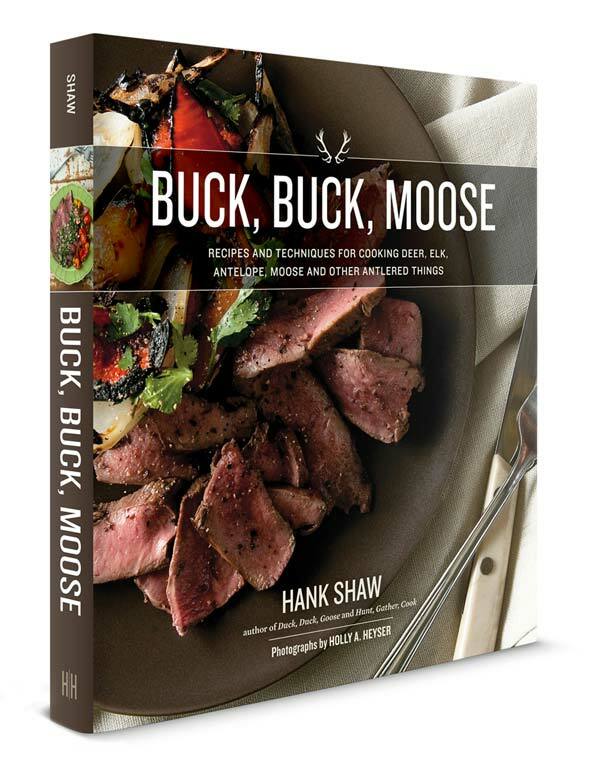 You can find recipes for every variety and every cut of venison, elk, moose, etc., right here on Hunter Angler Gardener Cook! BWags: It should be fine, but you might need to salt the meat when you slice and serve, as the salt will not have reached the center of the roast. 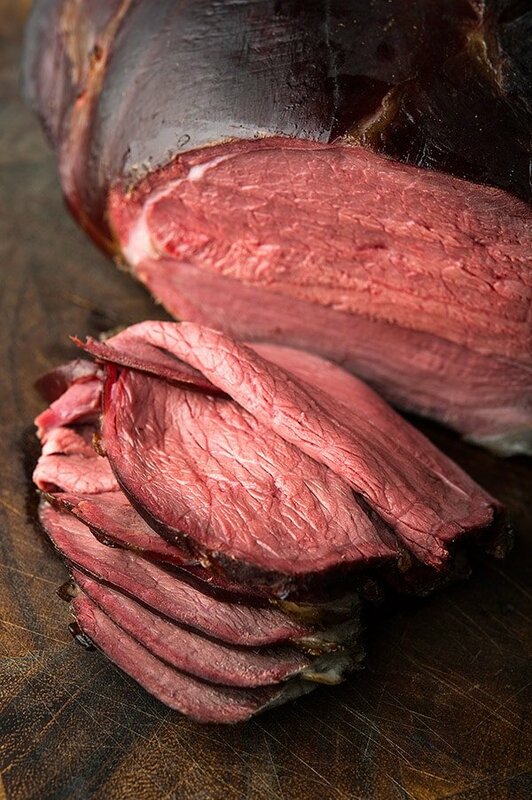 Is there a way to slow roast a venison ham like this in an oven or a standard charcoal grill? JR: Sure. Do the same thing, using either an oven or a charcoal grill. Simple as that. Hardest part on charcoal is keeping a consistent low temperature. You’ll need to put coals on one side, the meat on the other. Do not let the simplicity of the ingredients stop you from trying this. Weigh it out and take the time. I did this with a two pound caribou roast and smoked it low. It was delicious and will be making this throughout the years now for lunch meat.